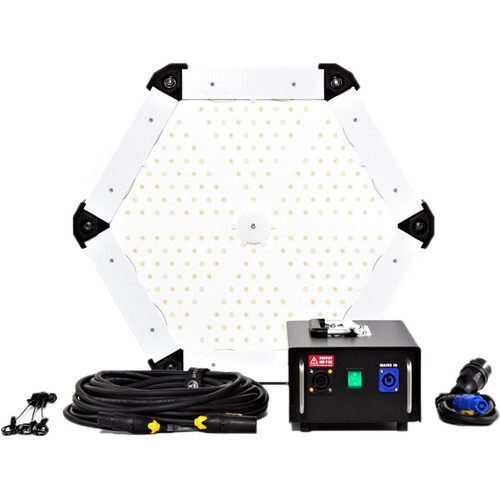 Built around a powerful fixture with advanced control features, the SUMOSPACE Bi-Color LED Basic Kit from SUMOLIGHT contains the core components to get up and running with the light. The kit includes the SUMOSPACE fixture, power supply with cord, a head feeder cable, and a hanger to suspend the light overhead. The 22" diameter SUMOSPACE LED fixture consumes just 400W of power, while outputting the equivalent of a 6K tungsten light. Color temperature is variable from 2800 to 6500K to meet any ambient light challenge, match other fixtures, or just for creative expression. At any temperature, the SUMOSPACE boasts a high CRI/TLCI rating of 95/99, an indicator of accuracy in color reproduction. Light intensity is also dimmable from 0 to 100%. While you can make these adjustments locally on the fixture, you can also do it remotely from a console via onboard DMX, Wi-Fi, and wireless interfaces. The SUMOSPACE can be seen but not heard thanks to its numerous tiny heatsinks, an asset in sound-sensitive environments. The SUMOSPACE is also flicker-free at any frame rate for high-speed or slow motion shooting. The SUMOSPACE has a wide 120-degree beam angle that is adjustable with optional, interchangeable 30 and 60-degree optics that are available for scenarios that require a tighter beam spread. SUMOLIGHT offers numerous accessories to modify the quality of light. A reflector, long and short diffusion skirts, and black skirts covers are available to contour the output to your requirements. The SUMOSPACE is ready for worldwide use thanks to its 100 to 240 VAC power supply.